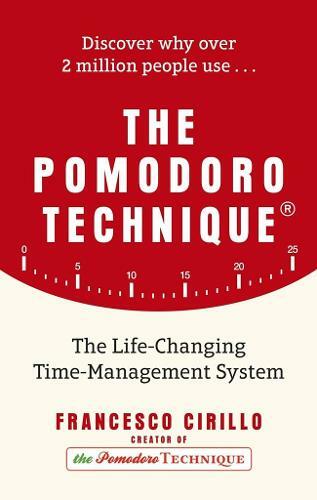 Available in bookshops for the first time, the internationally acclaimed time management system that has been used by millions, written by Francesco Cirillo, creator of the Pomodoro Technique. We all face the same problem: we're constantly busy but we never seem to get anything done. We know we should focus on the task in hand, but it feels impossible with so many distractions and demands on our time. We all need The Pomodoro Technique. This deceptively simple tool, now being used by more than 2 million people around the world, helps us regain control and achieve our goals. It transforms both work and home life by splitting days into 25-minute `pomodoros', which focus our minds and make us far more productive. Drawing on more than two decades of refinement and thinking, this powerful little book will teach you how to . . . -Work with time -Eliminate burnout -Manage distractions -Create a better work/life balance . . . all using only a pen, some paper and a timer. Start now - and join the Pomorodo revolution. Fully updated edition with exclusive material on teamwork - to make you and your team more dynamic than ever.